Ain’t It Fun-Paramore | Wedding Wisdom, Etc. “Ain’t It Fun” by Paramore is a fabulous dance song. It works terrifically well to get you and your friends up dancing. The accompanying video actually fits the lyrics perfectly. This song is called “Ain’t It Fun,” so instead of showing some heavy “green screen fantasia,” it merely shows the three lead members of the band….having fun. 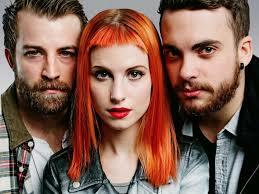 Those three are actually Hayley Williams, Taylor York and Jeremy Davis. I actually wanted to go out and smash a clock with an electric guitar the first time I saw the video. Musically, I love that the repetitive 5-note guitar riff doesn’t just fade out after the intro. It keeps repeating throughout. It’s just a really fun song to play and judging from guests’ reactions at parties, it’s really fun to dance to. Even the lyrics, which are sometimes completely inconsequential in a pop dance song, are funny, in a thoroughly appropriate though sarcastic way. Don’t go crying to your mama, when you’re all alone in the real world. I love this song. Don’t let it “bum you out”. It’s definitely an independence anthem and a bit edgy, but the song is bold and its guitar riff is irresistible. And that makes it a can’t miss winner on the dance floor, and a great song to work out to.